This conversation once again highlighted, for me, just how ego-centric and individualistic our culture has become. Right to the point where salvation is seen no longer as a work of God’s amazing grace, but is something that we do and achieve by our decisions and actions. Jesus comes to his home town of Nazareth. To socio-politically oppressed people, poor people. Dare I say, desperate people? If salvation was something they could do, something they could decide to accept by an executive decision, don’t you think they would have done it as quickly as you can say Roman Empire? The fact that they didn’t, is all because they couldn’t. If you have ever been lost, oppressed, abused, depressed, hopeless, you will know the impotence of not being able to change anything by an executive decision of your choice. No plan, no strategy, no act of will can save you in those moments. That is what makes this one-liner sermon of Jesus so powerful. Jesus, in his home synagogue, is given the scroll of Isaiah to read from. He is no doubt, expected to teach from the passage and expound in great rabbinic tradition, the meaning of the words he has read. The people are expectant. Luke tells us, “a report about him spread through all the surrounding country. He began to teach in their synagogues and was praised by everyone”. The expectation in the synagogue is palpable. This text would be a Liberation Theologian’s dream. Words of exhortation to revolt and resistance spring easily to mind. It is an Evangelical’s dream text. Words of of invitation to make a decision for Christ and cast off the shackles of sin flood this preacher’s imagination. There probably isn’t a genre of preaching that could not mine this text to profound and dramatic effect. But the home-boy Rabbi applies none of these techniques. With every expectant eye rivetted upon him he sits down! Our parents in the church who set up the lectionary were very skillful to break Luke’s record at this point. Next week we will pick up the thread and see the reaction of the congregation to this one sentence sermon, but for now, we are left to allow those nine words to sink slowly into our contemplation. In a world where I have been told that is all depends on me, my actions, my strategies, my plans, my decisions; to be confronted with the fact that there is nothing to DO is a conundrum. The word that is translated, “fulfilled” means exactly that, “filled to the full” Pleroo is defined as: to make replete, that is, (literally) to cram a net, level up a hollow, (hints of John the Baptizer’s valley filling sermon here). It is a word that describes complete accomplishment. There is nothing for me to do here, and it drives my Western activist mind nuts! This is why I am so grateful for the blessed times I have spent in dialogue and practice with my spiritual siblings from the religions of the East. Hindu and Buddhist alike have a rich tradition of contemplation that invites the practitioner to simply “Be here now” in the phrase of Ram Dass. 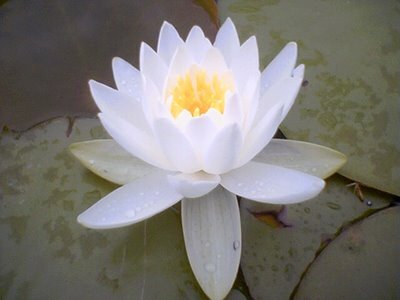 A practice that does not rush to change what it has not yet fully understood, a practice that sees the perfection of the lotus flower growing in the pond of raw sewage. It is a practice that makes me understand Jesus far better and enables me to make more sense of that nine word sermon. As I become still, I know… that God is… Good News. The good news is that “The Spirit of the Lord is upon us,” that there is “good news for the poor,release to the captives and recovery of sight to the blind. There is good news that the oppressed are free, and this is the year of the Lord’s favour. This reality already exists right here right now, if I will only stop trying to recreate and relocate all the world to a place where they all resemble my culture, my creed and my economy. and I have realized that the scripture has already been fulfilled. This does not mean no action, but it does mean no cultural imperialism. It means realizing, recognizing, accepting, that the one who reads the scroll, knows what he is doing,and so will I, if I stay close to HIM. This week I am trying to relate the work and gifts of the Spirit – 1 Cor 12,13; to the Luke reading. Strangely related… fun, and full of promise. It is so magnificent! Thank-you Peter. Dear Peter – I stumbled on your website through textweek last week. And now twice your insights have compelled me and caused me to think in a new way about how to preach the passage at hand. Thank you. Thanks Peter. Certainly speaks in to that all pervading Christian imperialistic attitude which I find to be so disturbing. I think that a presence which is simply present without the need to shape and mould has within itself immense transforming power. Great post. I followed the link to your website from textweek. Thanks so very much for your rumminations and sensitive insights. With so much suffering in Haiti and around the world we could use more voices like yours crying out in and for the socio-political marginalized and disenfranchised. I hope to mirror your attitude in this week’s sermon. Thank you so much for stopping by The Listening Hermit, and for your encouraging comments. Living in Africa, as I do, suffering is at the door but as you say, Haiti is such a challenge for COM-passion. Thanks Peter for your reading of Luke. Its given me a great insight for my sermon preparation. Being from India and now living in New Zealand, I have been blessed with a hugely varied context, and still dealing with the same text. Thanks once again. I live and work in a parish where the poor, the oppressed and the prisoners are a daily flesh and blood reality. There is such pressure to “do something.” The challenge of ministry is in discovering that sense of fulfilment, what God has already done, and somehow bringing that into view. It is hard as westerners not to become “human doings” isn’t it? Appreciate the visit and the insight.